Another one! *facepalm*. This picture is taken in Kroger. WTF?! 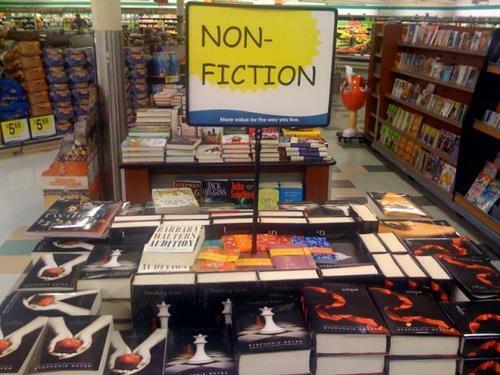 I think Twihards really shoudn't be let to display the 책 in a bookshop. Newsflash! Exhibiting Twilight 책 under non-fiction category does NOT make 당신 precious Cullens real! ;). Wallpaper and background images in the Critical Analysis of Twilight club tagged: critical analysis twilight fail cat anti. This Critical Analysis of Twilight photo might contain 신문 판매대, 신문 가판대, 서점, 헌책방, 서 점, 헌 책 방, and 독서실.